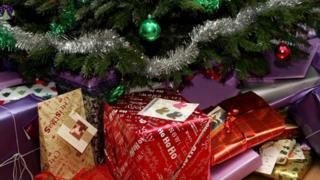 Can old Christmas toys make you rich? Image caption Are your toys of Christmas' gone by now worth a few pounds? Few childhood moments match the Christmas morning joy of ripping off the wrapping paper to reveal that sought-after toy yearned for all year. But, perhaps reluctantly for some, the time comes to put away childish things. In the darkest corners of many attics and spare rooms lie the toys of Christmas past. And those once much-loved and played with presents may now have a value beyond nostalgia. And it's not just the super collectible items, like the Star Wars Jawa figure that fetched £20,000 or the Steiff teddy bears estimated to be worth £10,000. Toyologist Peter Jenkinson said any number of "toys that we all played with as kids are now worth more than a few quid". "Most of us are not going to have the original Atlantic City Monopoly board game or complete collections of Star Wars figures still in their blister packs. "But there is value to be had in some of the most popular toys, annuals and games, things that the average Joe might well have in the attic," he said. So what's worth a rummage in the roof space, a look in the loft? "There's most definitely value to be had in the world of board games," Peter said. One to look out for required players to successfully escape an unexplored tropical island and was a big mid 1980s hit. "Fireball Island was one of those that you had to be quite lucky to have, but if you have an original then you are probably looking at £150-£200"
He said to also look out for "old Ludo sets of the 1940s and 1950s, the ones that "look like works of art". "If in good nick they most definitely are now worth a few quid." No Christmas of yesteryear was complete without the annual and it seems there is a real collector's market for them. "I'm talking not only about just the Marvel or DC comics, but the Beanos and the Dandies that we all read. "If you have a consecutive run of 10 Dandy annuals from 1972 to 1982, for example, you are going to see some good money back," he added. Few toys create such a buzz, or are worth as much, as the most collectible ones from the Star Wars universe. New movies, new characters and the retro desire of those who grew up with the original toys and films - now with a newfound spending power as adults - continue to fuel its popularity. "Star Wars will always be popular but the original toys are still the best. It's well worth a look upstairs if you think you have anything from the 70s or 80s up there." Not everyone however "will have a Boba Fett" worth £18,000, Peter advised. Like Star Wars, Transformers is still a huge draw with a big value among collectors. "Transformers are the other giant of the collector's world, still a second to Star Wars, but again any original toys have a real added value," Peter said. "One thing worth a few quid is the set of Transformers that were given away for free with a McDonald's happy meal back in the 1980s, they are very collectible. "A complete collection could get you about £250," he added. "Sindy wasn't around for very long before she was usurped by Barbie," Peter said. "She was simply overpowered by Barbie and all her American might." That however, could well add to the value of the Sindy doll. "You'll see that if they come up at auction, and are boxed, they can fetch £350 to £400." She may have overpowered her UK rival, but Barbie too has a retro resonance with collectors. "Often however to have real value, a Barbie needs to be boxed and have value as part of a bigger collection. "If for example, you have all 10 of the Mary Quant range from 1967, they are not just worth £200, they are worth many multiples of that," Peter said. Rebranded from the US GI Joe, Action Man has been a highly prized boy's toy for much of his 50-plus years. "If anyone has the working eagle eyes Action Man from 1979 to 1984 then you are probably looking at a value of about £400," he added. No list of valuable toys would be complete without a mention of Lego. "Lego is really important because so many of us have played with it for so long and because it's been said that if you had invested correctly in Lego over the course of 20 years, you would have made more back than if you had invested in gold," he said. "When you combine Lego with something like Star Wars or Harry Potter suddenly you could be looking at something worth thousands." A Harry Potter Hogwarts Castle from 2002 "could now be worth close to £3,000, and early Lego Star Wars Death Star could fetch double that," Peter added. "Of the top 10 most expensive Lego sets today, five of them are from Star Wars." So is it possible to spot this year's toys that will have a long term worth? Original packaging, the rarity of an item, whether it is part of a set and how well a toy "taps into the zeitgeist" all combine to determine its worth, according to Peter. "It's about spying the trends and looking at things not just appropriate for one demographic. So it might be something that appeals to kids who grew up in the 1980s, but that also has a relevance for children of today too. "Something that gives you double the reason to buy it. "But in many ways making money from toys going forward is not something you can do with any real foresight. It's can be about getting lucky and spotting something that has largely gone unnoticed," he said. Christmas annuals in the attic - what are yours worth? Video Are board games still an essential part of Christmas?